UPDATED: Sat., Aug. 18, 2018, 5:42 p.m.
Novak Djokovic (10), Serbia, def. Marin Cilic (7), Croatia, 6-4, 3-6, 6-3. Roger Federer (2), Switzerland, def. David Goffin (11), Belgium, 7-6 (3), 1-1, retired. Kiki Bertens, Netherlands, def. Petra Kvitova (8), Czech Republic, 3-6, 4-6, 6-2. Simona Halep (1), Romania, def. Aryna Sabalenka, Belarus, 6-3, 6-4. Philipp Kohlschreiber, Germany, and Fernando Verdasco, Spain, def. Henri Kontinen, Finland, and John Peers (3), Australia, 2-6, 7-6 (2), 10-7. Jean-Julien Rojer, Netherlands, and Horia Tecau (6), Hungary, def. Feliciano and Marc Lopez, Spain, 6-3, 7-5. Juan Sebastian Cabal and Robert Farah (7), Colombia, def. Nikola Mektic, Croatia, and Alexander Peya, Austria, walkover. Jamie Murray, Britain, and Bruno Soares (4), Brazil vs. Jean-Julien Rojer, Netherlands, and Horia Tecau (6), Hungary, 6-7 (7), 6-2, 10-6. Juan Sebastian Cabal and Robert Farah (7), Colombia def. Philipp Kohlschreiber, Germany, and Fernando Verdasco, Spain, 7-6 (5), 6-4. Anastasia Pavlyuchenkova, Russia, and Anastasija Sevastova, Latvia, def. Lucie Hradecka, Czech Republic, and Ekaterina Makarova (7), Russia, 6-3, 6-3. Elise Mertens, Belgium, and Demi Schuurs (6), Netherlands, def. Kaitlyn Christian and Sabrina Santamaria, United States, 6-1, 6-4. 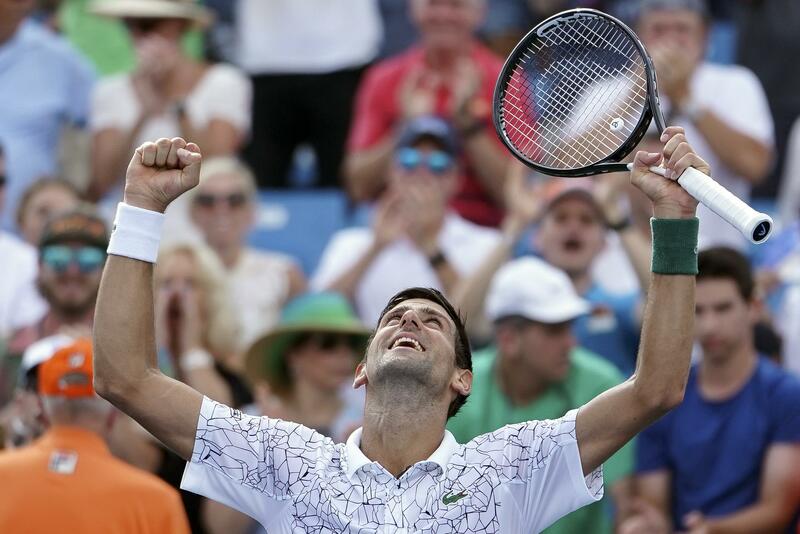 MASON, Ohio – Novak Djokovic is again so close to the one title that eludes him. And the same nemesis is standing in his way, all over again. It’s a moment in time: Djokovic vs. Federer for a title. The two tennis greats haven’t faced each other in two years because of injuries. They’re back for the 18th shared title match of their careers. Djokovic leads in head-to-head title matches 11-6. Djokovic leads the overall series 23-22. Everyone knows who’s favored in this one. Federer has won 14 straight matches in Cincinnati and 17 of his last 18 sets. He’s held 95 consecutive service games while dominating the tournament. On the women’s side, No. 1 Simona Halep will play for the title a second year in a row, facing Kiki Bertens. Djokovic is a tantalizing one victory away from the only ATP Masters 1000 title he’s never claimed. Djokovic is trying to become the first to win all nine events since the series started in 1990. The seven-time champion won the first set 7-6 (3) against Goffin, who was struggling with his serve. Goffin got medical treatment on the back of his right shoulder, and retired after the second game of the second set – 62 minutes into the match. Now, it’s on to his first Cincinnati final in three years. Federer won it in 2015 but was sidelined the last two years because of injuries. “I feel like I’m trying to defend my title from way back when,” he said. In the women’s bracket, Halep reached the final for a second straight year, beating Aryna Sabalenka 6-3, 6-4. Like Djokovic, she’s never won the title, losing both of her chances, including the title match last year to Garbine Muguruza. “It’s going to be a big challenge for me to play another final and win it,” she said. She’ll face Kiki Bertens , who advanced to her first Western & Southern final by wearing down No. 8 Petra Kvitova 3-6, 6-4, 6-2. A week of rain delays and double-duty days wore on players, many of whom wound up playing twice in a day. Kvitova faded in her second straight three-set match, ending her best showing in Cincinnati. She’d made five previous appearances in semifinals this season, winning each tournament. Published: Aug. 18, 2018, 11:18 a.m. Updated: Aug. 18, 2018, 5:42 p.m.